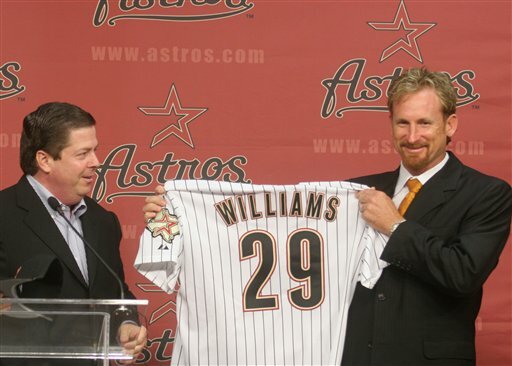 Long-time friend Woody Williams signed a two-year contract today with his home town Houston Astros. Woody spent this past season in San Diego, his second stint there with the Padres. We got to know Woody and Kim when he played for the Toronto Blue Jays at the start of his long career. What a great couple! A wonderful family! CONGRATULATIONS, Woody! We wish you all the best now that you've come home to the Astros! he is a good pitcher, wish he would had stayed with the Cards! hope all is well David! You are getting as bad as me. You are kindly visiting all your blog buddiea and neglecting your OWN blog site. That David every so often gets on a "telling us off spree", about not making posts. You didn't know he was that type,eh? You better listen to Terry! She knows me pretty well! Let's celebrate God's faithfulness this weekend, the 2nd blogiversary of PILGRIM SCRIBBLINGS! Hey David...I never noticed this great station that you had here! It is SO good and I can even listen to it while I am writing to you. I wonder if Jel has noticed it. Oh Roger Bennett is singing..."Ive Read the Back of the Book and we WIN!!" And we ARE winning, eh David!! Now they are singing Christmas carols! David did you go to Copps in Hamilton the one year that they had a Southern Gospel Quartet Convention? I will never forget what that Gerald did. He sang "O Holy NIght" and got a standing ovation in the middle of the hot summer!! Way too funny! At that convention, it was the year of the special quarters and I gave each member of each group a July celebration quarter and the unity maple leaf quarter. Ed O'Neal said that he would use it for some kind of golf marking. You know what, I didn't think the Talley Trio was SO good. They are singing, "Thinkin' About Home" What a lovely song and just about my type of people. Elderly people! Speaking of which, I better say good night again David...I have to get up early in the morning to work. I would be able to sleep in a bit but that Bernie of mine wants to go to the "office" [Macdonalds] BEFORE I go to work!! So it's up at 7 am for me! !And then he will want ot go there again AFTER I work a ten hour shift!